Can you truly know yourself? Just pause for a moment and think about it. Quite an interesting question, isn’t it? What if I told you that the structure of the question itself is misleading? It will never give you the answer you seek. Consider this: if there is you then who is yourself that you want to know? The language you speak has a subject and an object which forms a duality that you apply to the outside world for practical purposes. But in the process, you also apply it to yourself. And so you form a separate self and identify with it completely, believing it to be the absolute reality of your existence: your name, physical appearance, occupation, social class, material possessions and so on. All of these things can be a source of happiness or deep misery. If you’re still reading this, then you might be wondering if there is more to you than that. I asked myself the very same question a few years ago when I hit a plateau in my meditation practice. I could sometimes see my thoughts, but they still controlled my behavior to some extent because of the inner resistance. I was still identified with mental concepts in my mind. Luckily, I was looking for new books, and The Power of Now kept showing up over and over until finally, I decided to give it a try. And that was the beginning of a total transformation. In this post, I want to show you how this book can help you find your true self or at least push you in the right direction. How often do you look at the clock during the day? Usually, looking at the clock means you’re in a hurry, you have something important to do, or you need to be somewhere else. In other words, you’re creating a psychological time: you project yourself into the future, some perfect moment that will solve all your problems or make you happy. It happens when your thinking mind clouds the present moment. So how do you escape the trap of psychological time? The first thing you can do is turn psychological time into “clock time.” That means to use time in the practical aspects of your life. Planning your next vacation? Instead of counting your days and imagining yourself on the beach sipping cocktails, make a list of all the things you need to accomplish before your trip. Love every second you spend planning and preparing instead of hating every day that you’re not on vacation. Made a mistake and embarrassed yourself in front of your colleagues? Instead of dwelling on that moment mentally and torturing yourself, learn from your mistake. Review every detail that led you to that situation and take necessary steps to prevent it from happening in the future. When using clock time, you’re fully in the present moment but peripherally aware of your past and future. The focus of your attention is always on the step that you’re taking at this moment in the Now. Have you ever experienced resentment, hatred, self-pity, guilt, anger, depression, jealousy? Do you know the root of these emotions? The answer is complicated and simple at the same time. If you’re unconscious of your thoughts, they get reflected in the body as emotions. What’s more, every emotional pain that you’ve experienced leaves a residue inside you. That residue takes a life of its own and eats away at you continuously like a parasite. After a certain stage in its development, it finds other parasites and merges to form a pain-body. Every time you’re overwhelmed by emotions direct the focus of your attention into your body. Feel it from within. Feel the life energy in your hands, arms, legs, feet, abdomen, chest. After a while feel this energy coursing the entire body. Stay with that feeling as long as you can. 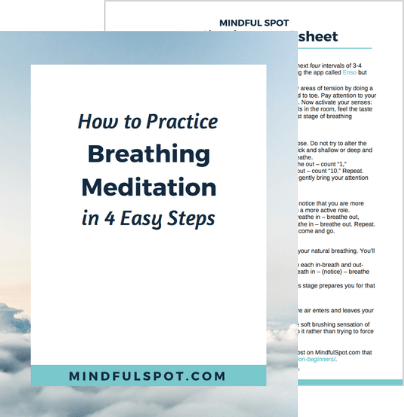 By doing this simple exercise, you break your mental identification with the mind and find something more real than the abstraction of thought. Have you seen a mad person in real life or a movie? The one with crazy eyes mumbling gibberish non-stop. Well, you do the same thing but only in your mind. All the time. What’s worse, you’re not aware of that voice because you’ve been living with it your whole life. That voice got all kinds of crazy ideas. It’s always on, even when it’s not needed. For example, it might be telling you about embarrassing moments from your past, or it could be showing you a mental movie of the future where everything goes wrong. Eckhart Tolle calls that voice the thinker or the false ego born from total identification with your mind. So if you’re not the thinker, then who are you? If you practiced meditation, then you know that in the process you gain the ability to see your thoughts. Little by little the gap between you and your thoughts grows and you start to notice something more real beneath the thinker. It’s the observing presence, the silent watcher of your thoughts. You can become aware of the silent watcher when he observes your thoughts, and you observe him. That is a process when consciousness becomes aware of itself. So can you find your true self and how do you do it? Start by reading the book. It’s written in the form of questions and answers. The key to full understanding is this: once you can hear only one question asked and one answer given then you can be sure that you’ve absorbed the wisdom fully. You can buy Kindle edition from Amazon, but Audiobook from Audible is the best option. If you don’t have Audible account yet, you can create one and get your first book for free. And it goes without saying that the first book should be The Power of Now by Eckhart Tolle. This book also changed my life. Thank you for sharing, Emily. This book had a profound impact on me as well. It gave me so many answers that I couldn’t find before. It also helped me deepen my meditation practice and see mental fiction created by my thoughts.